For business perspective, it is very important that you have a proper communication with your clients or customers because if you are not able to pitch your service or product smoothly the chances are very rare that you will get any conversions for your business. One special way to communicate to your potential customers without any fuss is through an email marketing service, when you send an email template that has been constructed on your own, you have a sufficient time doing the proofreading as to what can be included in the mail to keep him engaged. So, for the same purpose, we have collected a bunch of software here that enables you to deliver a unique email template that will convey your business message in the most professional way possible. MailGet is one of the most productive email marketing software that enables you to send bulk emails simultaneously to a number of people, the software allows you to create, send and track the emails sent by you. It provides you with impeccable features like drag & drop email builder, email list cleaning, list management, etc. Apart from this, you can connect with various SMTP of your own choice. For example Mailjet, Postmark, Mandrill, etc. MailGet provides you with a free trial for 30 days. You can send unlimited emails up to the 100 subscribers in a month. Starter: To avail this plan, the cost is $5 per month in which the user can send emails to 5,000 subscribers. Rookie: For acquiring this plan, the buyer will be paying an amount of $29 per month. Also, you can send unlimited emails to 25,000 subscribers. Pro: While, for this pack, you have to pay the price of $49 every month. Along with this, you will be able to send emails to 50,000 subscribers every month. Advance: In the highest plan, the customer will be paying $79 per month which will be billed annually for which he will be allowed to send unlimited emails to 1,000,000 subscribers. For more plans, you can go through the service provider site. There is a “drips” section in the software through which you can select a specific date and time slot to send bulk emails to the customers. With the help of autoresponder function, you can send an auto-generated mail when a customer fills the subscription form on the website. The software also contains an auto-follow-up function. In this function, you can send follow up emails again & again in case they are not read by the user. 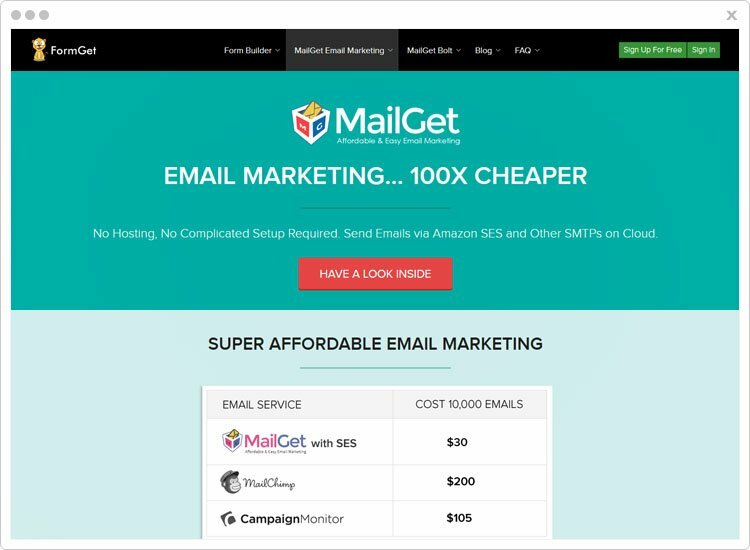 After trying all the software, I found MailGet email marketing service to be one of the best email marketing service in terms of pricing and the awesome features that it provides, the lowest plan that it provides is starting at $4 which was way low in comparison to other software. 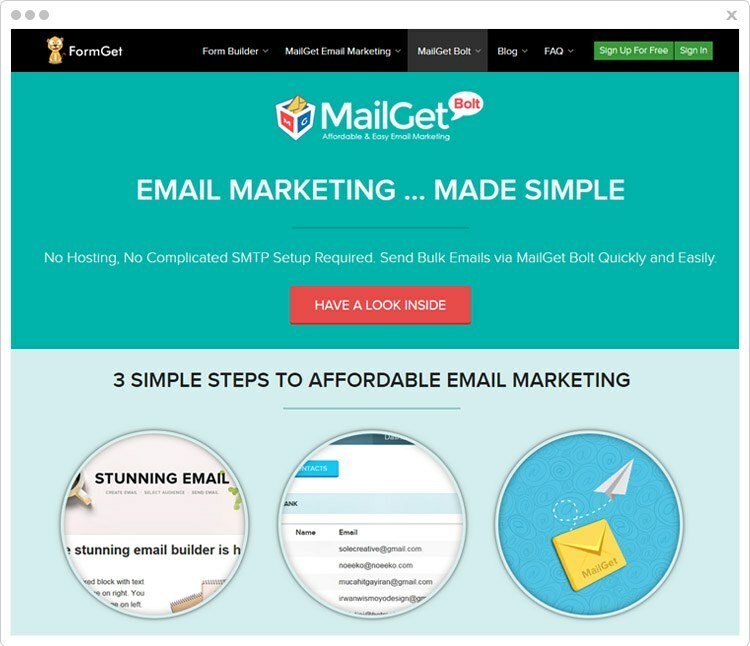 MailGet Bolt is another amazing software that gives you the authority to create & send multiple emails to a number of people. A great attribute about the software is that it has an inbuilt SMTP via which you can send mail through your own servers. With this software, you get exemplary features such as email list cleaning, auto followup tool, subscription form and a lot more. 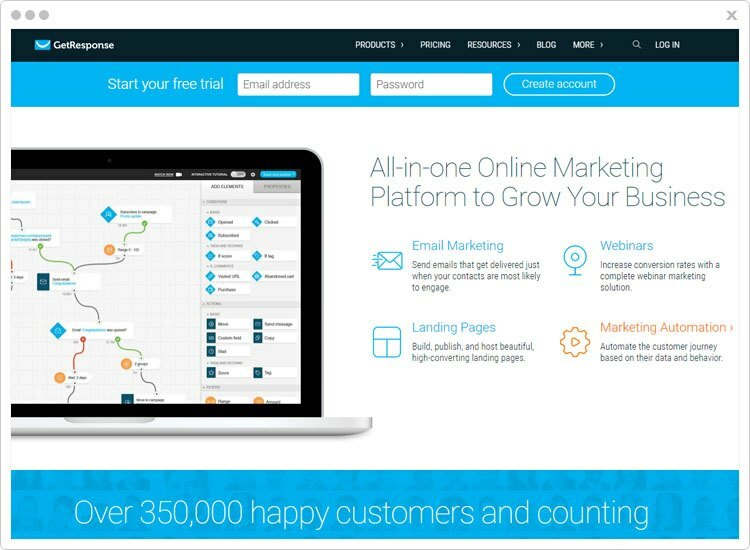 This email marketing tool provides you with a one-month free trial. You can send emails to 9000 subscribers for free of cost. First Plan:– This software is available at $9 per month in which the user can send unlimited emails to 2,500 subscribers. Second Plan:– In the plan 2, the buyer will be paying $19 per month and the user can send unlimited emails to 5,000 subscribers. Third Plan:- According to the highest plan, the user will be charged $34 per month & send unlimited emails to 100,000 subscribers. Fourth Plan:- As per this plan, you can send emails to 15,000 subscribers just by paying $49 every month. The software has a stupendous email deliverability rate which is 99%. Hence, you can send emails directly to the recipient’s inbox without landing in the spam. 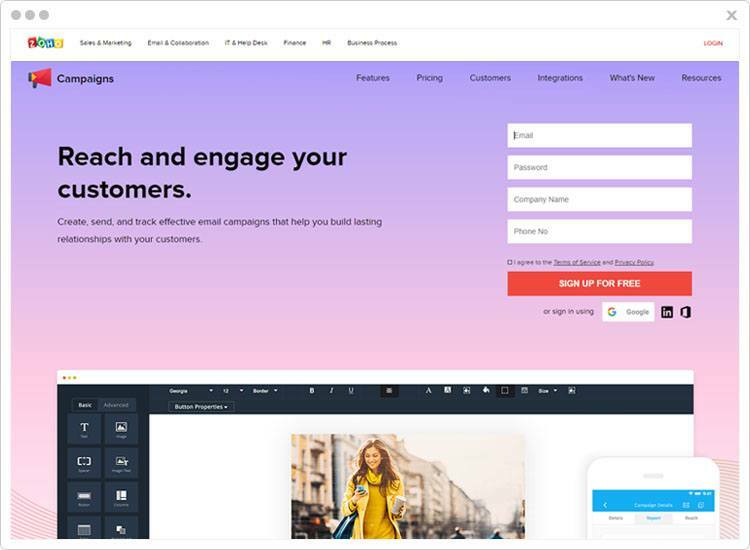 A drag and drop builder will ease the task of creating a new & refined email that can convey your marketing message in a better way. You simply have to drag the entity and drop it on the content section. Through the feature “email inbox preview” you can make any last minute changes. This makes sure that you have a full proof check of the email that you are about to send. On a personal level, it is my recommendation that you should go for the MailGet Bolt, the mere reason is the inbuilt SMTP that you will be getting in the software which gives you the power to send emails through own server, also, the open rate is also quite which 29%, that is commendable for the initial phase. Through the Campaign Monitor you can convert strangers into customers by sending them personalized emails. You can effortlessly construct these emails with the help of a drag and drop builder. This builder will let you create professional email templates that will look great on every device. Basic :- In the basic plan, the user will have 2,500 emails across campaigns and automated emails for which he will be paying $9 per month. Premier :- As per the premier plan the user will pay $149 per month and he will get unlimited emails across campaigns and automated email and phone and email support. Advance :- Need to contact the sales team. You can dig the data of your customers to build a hyper-targeted segment. Further, you can send pertinent emails that are tailor-made for the customers. This software has a feature known as the “time zone sending”. You can send email at the same local time around the globe. It provides you with “worldview” functionality. With this, you can track the sent emails and see how they are engaging the audience. ZohoCampaigns is an efficient email marketing service. It provides you with pre-defined templates, drag and drop editor through which you can construct emails & easy list management. Plus, you can also integrate your Zoho CRM account with the software and after sending the emails & you can see the results within your account. Free plan :- As per the free plan, the user will be able to send 12000 emails per month for 2000 subscribers. Lowest :- For the lowest plan, 1 to 500 subscribers will cost you $5. And you will get unlimited emails, workflows, social campaigns, etc. Highest :- As per the highest plan, 50001 to 100000 subscribers at $350. Along with this, you also get unlimited emails, workflows, autoresponders, social campaigns. Lowest :- In the lowest plan, the user will get 250 email credits for $6. Highest :- In the lowest plan, the user will get 750 email credits for $100000. Insightful reports of the software will tell you every detail about email performance like unique opens, clicks, shares, and more. This software allows permission-based email marketing which enables you to send email to ones who have opted for receiving emails. This ensures you get a better engagement rate. You can increase customers for your business by sharing your message with a larger number of people. This can be done by sharing on social media like Facebook, Twitter, LinkedIn and others similar software. GetResponse is a productive email marketing service that allows you to send bulk emails to a number of people. You can explore unlimited design possibilities through drag and drop builder in which you can drag the entities from the field section and drop in on the content section. Moreover, you can also construct the emails via HTML code editor. Email :- As per the email plan, the user will be billed $12.30 per month annually, in which he will get the service for a list size of 1000 in which the user will get landing pages and autoresponders. Pro :- In the pro plan, the user will get the features of the email plan, along with that, webinar 1000 attendees, costing $40.18 per month billed annually for 5000 list size. Max :- Similarly, for the max plan, the user will have the features of pro plan, plus, salesforce integration, and campaign consulting and more costing $135.30 per month billed annually for 10,000 list size. Enterprise :- In this plan, the user will have the features like campaign consulting, dedicated IP and more at $837 per month billed annually for 10000+ list size. The software allows you to customize from the 500+ predefined templates. Plus, you can also start from the scratch and create your own emails also. The system gives you the flexibility to choose from 1000 free stock images to provide your email a professional look. You can automate through autoresponders send predefined auto-generated emails to communicate well from the moment the customer sign up. 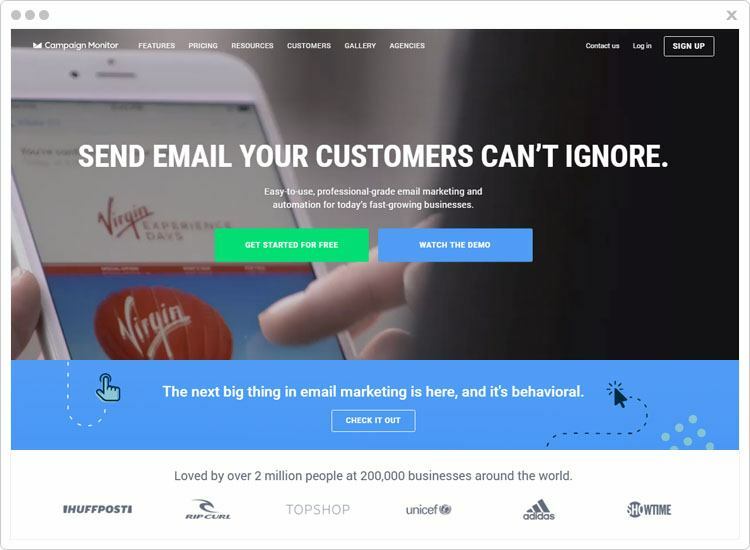 These were the best email marketing tools that will give your business a push by increasing your sales. The software provides the easiest way to grab the attention of the recipient. Thereby, increasing your chances of converting strangers into customers. Also, it gives you a number of features through which you can easily dominate the email marketing field. Lastly, we hope that you are able to find the perfect software for sending bulk emails. Share your views on the comments section below.